Speak Up! : A Guide to Having Your Say and Speaking Your Mind by Halley Bondy. Review: Middle school is a tough time for nearly everyone, but it can be especially hard on girls. Either they are too shy, too nervous, or too afraid to say their mind. Speak Up! A Guide to Having Your Say and Speaking Your Mind by Halley Bondy will help resolve these issues and teach you why and how to courageously voice your thoughts to friends, family, teachers, bullies, and crushes. This awesome book is for ages 10 and up. As suggested by the title, Speak Up! is about, well, speaking up. With bodies and minds shifting from kid to adult, it is sometimes difficult to break out of our shells and stand up for what's right. The book offers exercises to help empower people on this and other topics such as bullying, friends, and relationships (ooh!). In addition, it will show you ways to combat negative thoughts and similar obstacles. For example, the author had an eating disorder when she was in middle school. But she never spoke up about it, and it took a while, but she eventually got the help she needed. Speak Up! is a truly amazing book. The vocabulary is fit for the intended reader age, and is easy to understand. Though published this year, I think it will be helpful for future generations to come. I would give this must-read 5 out of 5 stars for being an overall helpful resource to boosting self-esteem. So remember, you should always be confident to speak up for yourself. Review written by Karla (6th grade student). We would like to thank Zest Books for providing a copy of Speak Up! : A Guide to Having Your Say and Speaking Your Mind for this review. 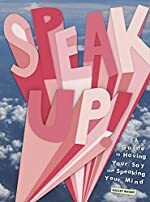 Have you read Speak Up! : A Guide to Having Your Say and Speaking Your Mind? How would you rate it?